Since its establishment in 1900, The Hippodrome Casino, London, UK, has been the home to many famous live acts. In 2009, however, £40 million was used to convert it into a land-based casino. Not content with it being the biggest casino in Britain, an online site was created, so players could access games 24/7. Managed by Betway Limited, there’s a superb selection of slots, roulette, poker, and blackjack, all broadcast on a delicately classy website. This Hippodrome Casino review takes a look at all the best features and benefits that have been recommended. The general rule of thumb with all casinos is that you read the terms and conditions before signing up. This ensures that you don’t get caught out with anything and you know exactly what you’re getting involved with. Only customers aged 18 years and over are allowed to gamble on the site. Your account will be frozen if the casino suspects you are underage. You may only open and operate a single account. You are required to keep your account up to date at all times. Hippodrome will consider an account inactive if after a period of 12 months after the last account login. A fee of £5 will be deducted on a monthly basis until the account is no longer in credit, or has become active again. All games at Hippodrome online casino are provided by worldwide giants Microgaming. These developers are one of the oldest in the industry, having been around since 1994. All the titles are blessed with the latest software, however, and this is reflective in their quality. Despite only one company working alongside the casino, there are hundreds of games available. We will discuss these below. There are a variety of games broadcast at Hippodrome Casino. It’s an important factor for customers when deciding to sign up or not. In total, there are around 500 games and something for players of all tastes. The home page will allow you to navigate exactly where you want to be too. Categories include 5 Reel Slots, New Games, Roulette, Live Casino, Progressive Jackpots, Blackjack, 3 Reel Slots, Video Poker, and Other Games. Slots have become the most popular way for gamers to get their fix. There are many reasons for this, including exciting bonus features, and low stake limits. Among the 3 Reel Slots available on the site include Coach Potato, Wheel of Wealth, Break da Bank, and Cash Crazy. If you’re looking for maximum excitement, then check out the 5 Reel Slots such as Immortal Romance, Starburst, Avalon, and Cleopatra. There’s also a chance to play some of the progressive slots. It may only take one spin to receive a life-changing sum of money. Titles include Mega Moolah, Mega Moolah Isis, Cash Splash 5 Reel, and Major Millions 5 Reel. Table games are split into categories on the site. There are 10 variants of blackjack, 10 roulette, 18 poker, and 15 other games, including baccarat, sic bo, craps, and red dog. As you can imagine from such a reputable land-based casino, the live games at Hippodrome are of high quality. There are 10 selections to choose from, such as roulette, blackjack, poker, and baccarat. The stakes are slightly higher than the normal table games on the site. Just simply click on whatever game you want to play, and you will be taken to the studio which is broadcast to you live via webcam. The graphics are crisp, and you can interact with the dealers and fellow players for a more authentic experience. One of the most attractive promotions that casinos offer its gamers is the welcome bonus. 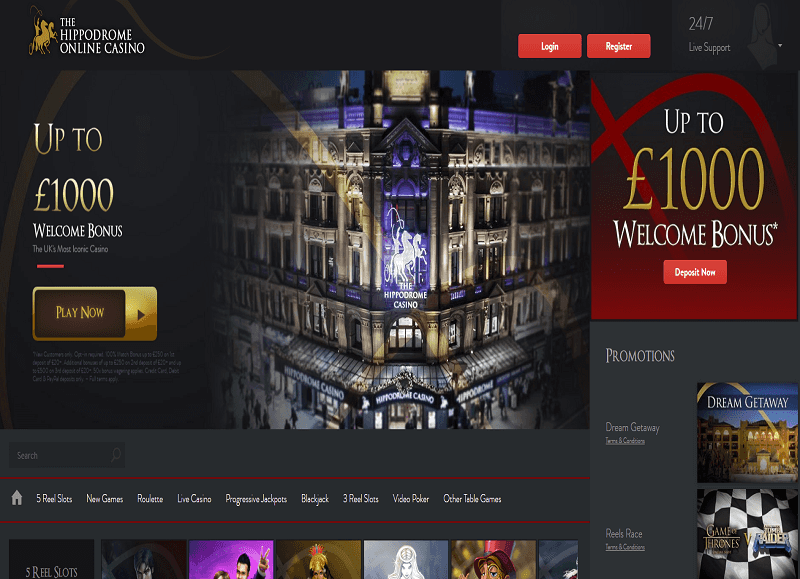 New customers making a real money deposit into Hippodrome casino will be able to receive up to £1000. This is split into your first three deposits. You will receive a 100% bonus up to £250 on your first deposit of £20+. In order to be eligible for the offer, you must check the box during the signing up process. As long as your deposits are made within the seven day period of your account being opened, you will receive a bonus with each one. There is a 50x wagering requirement that applies to each Welcome Bonus before funds can be withdrawn. Different games will count towards a different percentage of the wagering requirement. It’s worth checking the site to check up on these. Should withdrawal be made before the Welcome Bonus is shown, your bonus won’t be valid. The bonus can only be used once per person, family, shared computer, email address, and household address. The bonus will be subject to a 50x wagering requirement before any funds can be withdrawn. Your play will be checked for irregular playing patterns before any withdrawals are confirmed. Low margin, zero or equal bets will be classed as irregular. If this is the case, the casino will hold the rights to withhold any winnings. The casino holds the rights to only allow a maximum of £50 winnings from bonuses. Hippodrome Casino will ensure that winnings from any bonus used to play will be credited to the bonus balance. If it’s a mixture of cash and bonus cash, winnings are credited according to the bonus to cash ratio. This means you won’t have to deal with wagering requirements to withdraw your own cash. The only time you will is when you have used bonus cash to place the wager. These are the most popular methods for gamers and arrive from many different providers. These include Visa, MasterCard, and Maestro, and the minimum deposit is £10. All transactions are processed instantly, and there is no maximum limit. Even though there is no charge for this method, it is worth checking with your bank that there will be no charges directly from them. You will also be given a chance to fund your account using digital wallet methods. These include Entropay, Neteller, and PayPal. Most of the time, you will notice that the transaction is instant. If you’re using PayPal, however, please be aware that you will be subjected to a 3% charge. These are a great way of funding your online account in the safest way possible. Paysafecard is one of the methods supported by the casino. These can be bought from shops or on the internet. You will also no be charged for any deposits using this method. All methods of banking detailed above can be used for withdrawals, with the exception of Paysafecard and Entropay. Please be aware that there is a £10 minimum limit for all transactions and a maximum of £4,000 per week. There is also a pending time frame of 48 hours, meaning it will take up to five days for withdrawals to show in your account. World-class reputation due to their land-based casino in London. State-of-the-art software from various software developers, including Microgaming. Generous welcome bonus of up to £1000. Huge selection of games to choose from. Decent amount of banking methods. Great mobile app that’s easy to use. The casino is licensed by the United Kingdom Gambling Commission and also the Malta Gaming Authority. You will definitely be protected should you come into any problems, especially considering there are two authorities you can turn to. The casino will have been audited to ensure they provide fair and tested games, plus it’s checked to make sure your funds are not mixed with the casino’s business account. This means your money will always be safe and secure. 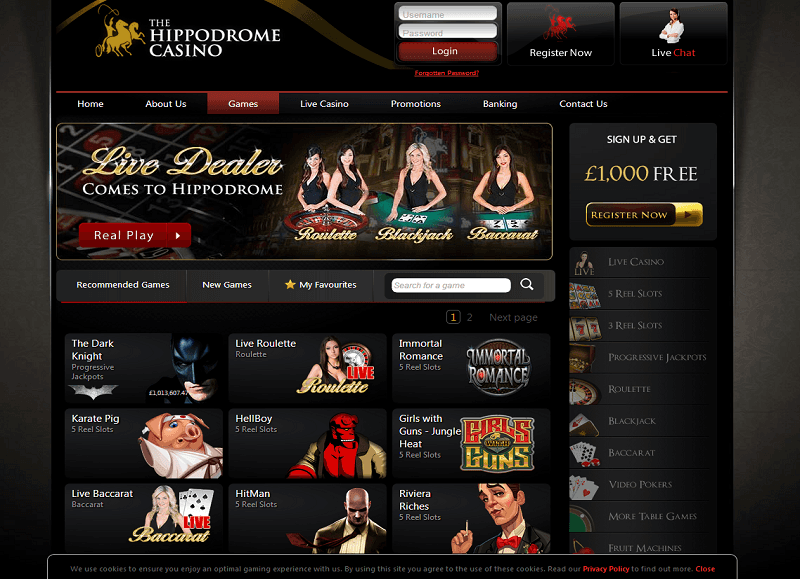 Hippodrome Casino is available to play online with no download required. All you need to do is access the site directly through your browser. Android, Apple and Windows are all supported. You can even download the app for free which makes it even easier to access the games. 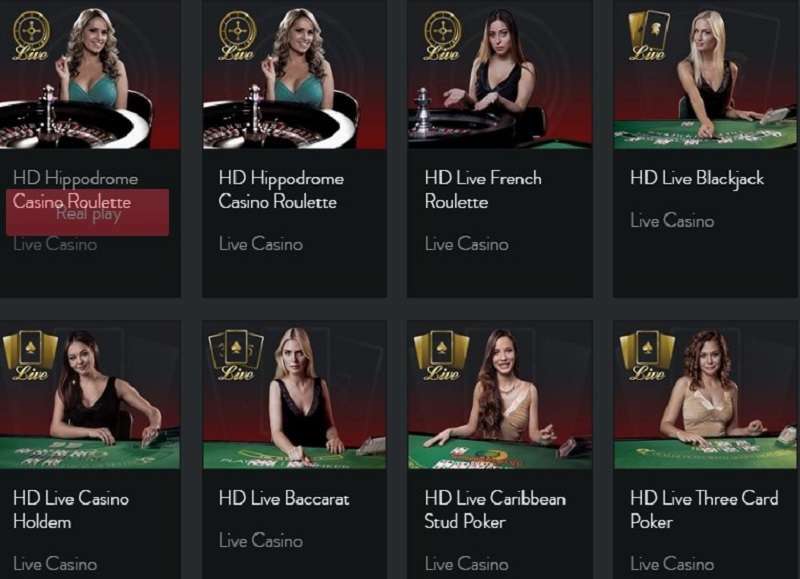 This makes it super convenient for players to enjoy Hippodrome Casino play online any time of the day. Payment information and details of transactions you carry out through the site. Communications with employees such as emails, calls, messages sent through live chat. Information regarding location, including IP address. Pages you have visited and what you have clicked on. Technical information such as what device you are using, and the browser you have used to access the website. And additional information you submit through the website for example on forums, chat rooms, comment sections, or in response to quizzes etc. The customer support team can be accessed through a variety of methods on site. These include online chat, telephone, and email. The fastest way to receive help is probably through the online chat as you can expect a prompt answer. This is also available 24/7, so it won’t matter if you run into problems in the middle of the night. It’s probably worth checking out the FAQ section first through, and the answer to your question may be on there. There are a variety of languages too including English, German, French and Swedish. It is evident that the Hippodrome brand has been around for over 100 years. They have proven through their online and land-based casinos that they know exactly how to appease gamblers. One of the main advantages of the site is the huge welcome bonus of up to £1000. There’s also a huge amount of games, however, from worldwide software developers Microgaming. This company has been at the front of every innovative breakthrough in the industry, and it’s great to have them on board. So if you’re ready to experience the best casino with high security, make sure you sign up to Hippodrome today!